The purpose of the settling is to remove from the water the naturally heavy particles or those formed previously during the treatment via flocculation and/or coagulation. This is carried out in basins that are generally rather voluminous. 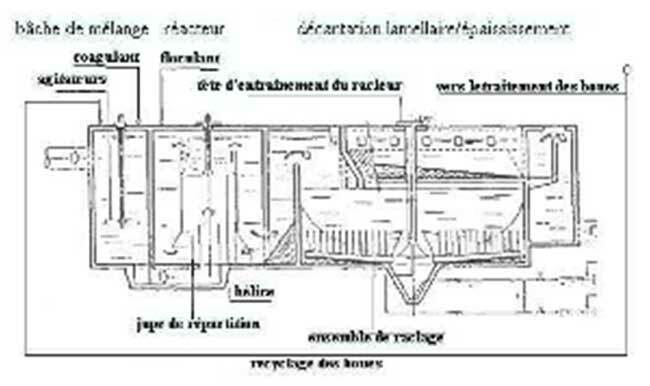 "Lamellar" settling consists in causing water to flow in parallel stacks of settling tanks of smaller dimensions, which has for effect to save a lot of space and increase the settling speed compared to the "traditional" method where we simply wait for the particles to settle to the bottom. This is a method that has proven its effectiveness and for which the principle is rather simple and the cost is less. Its advantage over "traditional" settling is to be able to obtain the same quantity of treated water in systems that are more compact (this in fact is a development in settling). The locations that are primarily concerned are water treatment plants (but sanitation also) for rather large-sized cities. This method is particularly recommended for cities with at least 50,000 inhabitants. The lamellar settlers are usually installed after the step of flocculation of the water to be treated which ensures the formation of flocs (larger particles formed via the accumulation of smaller particles) as the finer particles cannot settle correctly. The water flows successively over several lamellar settling modules or plates. 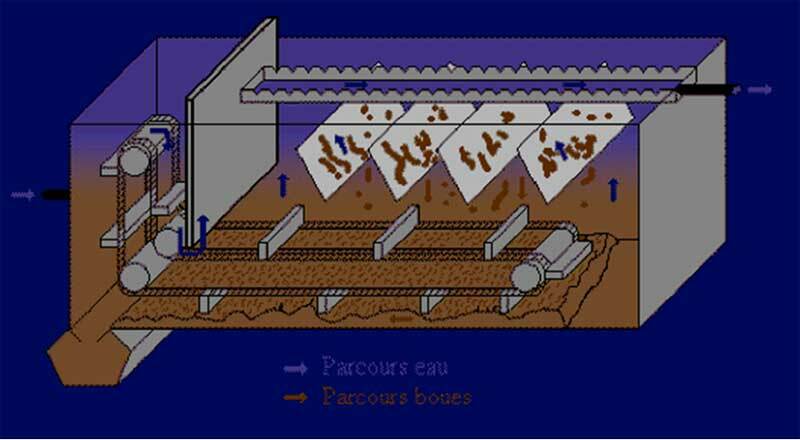 The removal of sludge formed by "lamellar" setting is faster than with the traditional method thanks to the increase in the deposit surface obtained by setting up lamellar modules (which can be simple plates) in the upper portion of the settling vessel. The size and the inclination of these modules are important parameters that condition the performance and the space that the structure takes up. 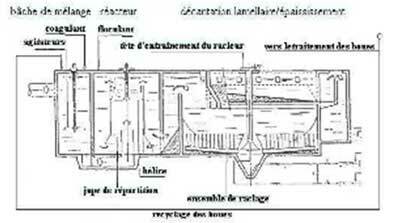 So they must be sufficiently inclined, not only so that the sludge continues to move down in order to settle on the bottom, but also to expose the largest surface area possible to the flow of water and improve the settling of sludge on their surface. The water is supplied from below, then the water rises along the plates, depositing its sludge. The water therefore has a movement in the direction opposite that of the sludge which descends along the plates. Advantages : Compactness, gain in surface, performance and lower cost. Possible clogging of the lamellar unit : avoid this through regular cleaning. 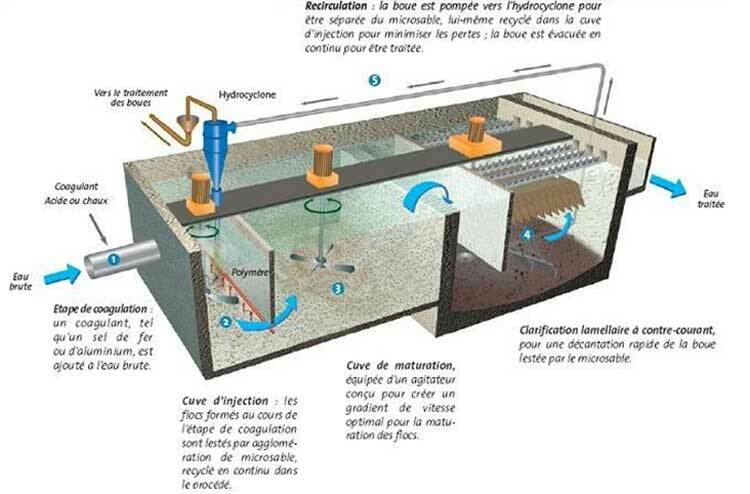 A mechanical system is preferred to remove the sludge. 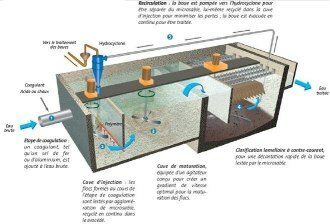 In the centre of INDIA, in Nagpur, a city of 2.5 million inhabitants, the French company Veolia Environnement has just completed the construction of a drinking water treatment plant that uses lamellar settling techniques. The latter have made it possible, without having to increase the surface of the plant, which would have been impossible due to a lack of space, to increase its treatment capacity from 113,000 m3/day to 240,000 m3/day while still improving the quality of the water and now making it available 24h a day, as it was only available on an intermittent basis prior to that.